The family of cue sports is enormous as, after many centuries of history, have included every game played on any kind of pool table. Each one of the main variants of the most important cue sports has also different variations, variations that have been played for centuries by many people and, for that reason, they are part of one of the largest sports lineage, the cue sports. Pocket Billiard games are considered the most popular among amateurs as each culture has developed its own pool variant introducing regional set of laws and deviation through the years. Pools (Pocket Billiards) are the most trendy sports in this day and age as these team or two players games are especially quite popular in entertainment establishment around the world and, here, in PoolandBilliard.com, we want you to have the most complete list with all of the most popular pool games. Eight-Ball: this is the most popular cue game on a pocket billiard table and its popularity has brought it to such a status that many people has given it the name of Pool. This game has also a long series of new variations such as Crazy Eight-Ball, Alabama Eight-Ball, Last Pocket, Misery, Missouri, 1 and 15 in the Sides, Rotation Eight Ball, Soft Eight Ball, and many others. The most standard Eight-Ball game has become quite popular and it is now part of the best Championships and Tournaments around the world. This game is played with 16 balls, the cue ball and 15 object balls (7 striped balls, 7 colored balls and the black ball number 8). The game starts with the Break Shot to spread out the balls. The first ball in the pocket will establish the players turn, that is to say, the group of balls that the player or team will have to put in the table's pockets. The goal of the game is to put the eight ball in a Called Pocket after clearing all of our group's balls. 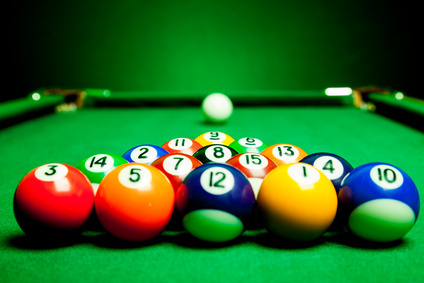 Nine-ball: this is another variant of the Eight-Ball game but it has gained so much popularity that has casted a shadow over Eight-Ball and many other Pool games. It is very well known because it has been played on International Tournaments for decades. 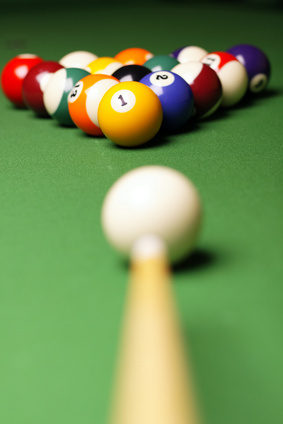 Nine-Ball is more of a professional game that has become the most popular pool game among cue sports. The goal is to put ball number 9 in the pocket by following the order of the balls. This game has a variant named Rotation that has introduced a new variation: the cue ball must hit the object ball with the lowest number. This rule has brought other modifications and now we can find several games such as Seven-Ball, Three-Ball or Ten-Ball, among others. Each ball is worth its number, a number that represents the players' points or score; the game's maximum number of points is 120 and, consequently, any score of 61 points will instantly grant the player the victory. 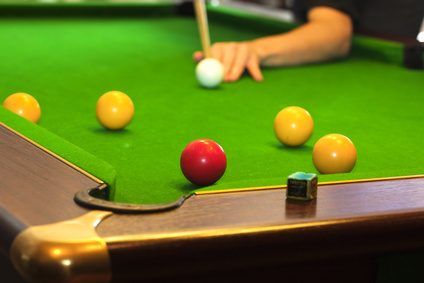 Straight Pool or 14.1 Continuous Pool: this game's goal is to reach a winning score, in general 150 points; players have to put the object ball (or Called Ball) in a pocket previously chosen (Called Pocket). Bank Pool: Bank Pool's main goal is to sink player's set of balls to obtain the highest score. Each Called Ball has to be pocketed into a Called Pocket by using at least one of the billiard table's cushions. Bank Pool game introduces the term Bank Shot, last shot for players to pocket the last object ball. Speed pool: Speed Pool introduces a new rule: the time. The balls must be pocketed in as fast as possible. This cue sport has gained so much popularity among professionals, an attractiveness that created the first International Speed Pool Challenge that has been held every year since 2006. Other variants of Pool games are Artistic Pool, Baseball Pocket, Blackball, British Eight-Ball, Chinese Eight-Ball, Bowlliards, Chicago, Cribbage, Cutthroat, Eight-Ball Highs and Lows, Equal Offense, Kelly Pool, Pea Pool, Pill pool, Killer or Trick Shot. There is another category for Hybrid games; these Hybrid's rules are just an alteration or combination of different games; some of these Hybrid games are Bottle pool, Cowboy pool or Poker pool. Other pool games have introduced objects (besides the object balls) that take the role of main goal. Obstacle and Target games are not as popular as the main variants but they are quite fun to play like Skittle pool and its variants Pin Pool.